Trolling through the latest offerings at Urban Outfitters, I came across this toasty campsite cover-up... all iconic yet trendy colourful stripes woven together in a cozy cocoon that only virgin wool can offer. It's the Pendleton Glacier National Park Blanket, created to honour the "history and romance of America's National Parks"... or so they tell me. BUT what it really is, REALLY is a rip-off of the traditional Hudson Bay Company Point Blanket. 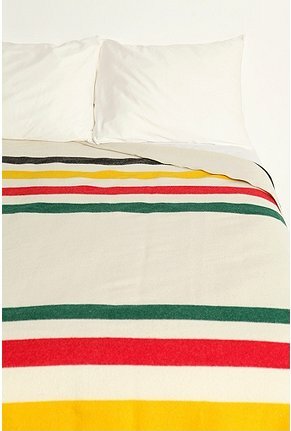 THE iconic blanket - the 230 year old historical blanket used by Canadian traders for centuries, and a design that is still sold today by the Hudson Bay Company, otherwise known as HBC on Canuck home turf. Don't give me this classic American park blanket nonsense -- they copied the world famous Canadian HBC Point blankie, plain and simple! Time to send an all-points bulletin to the copyright infringement police!